The U.S. has seen an increase in the number of natural disasters between the years 2016 and 2018. 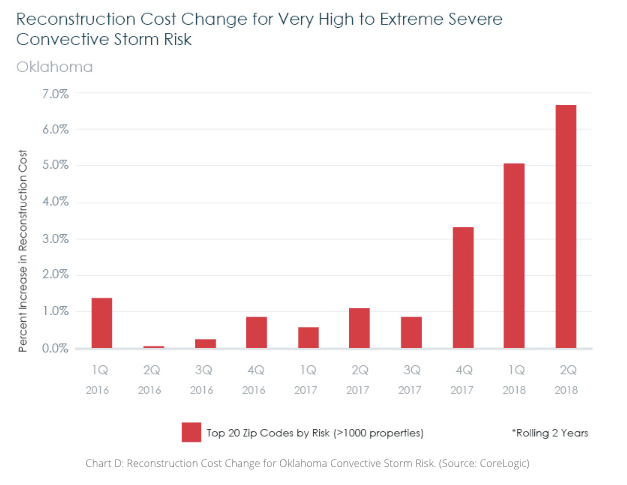 The resulting “underinsurance issues” have kept analytics and data-enabled solutions providers very busy with analyzing the new wave of areas that would be better served by increased natural hazard coverage. 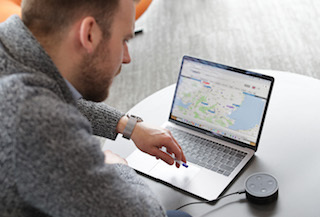 Crewes, UK-based Kinesis has integrated its vehicle tracking technology with Alexa, the Amazon Virtual Assistant. The artificial intelligence addition allows managers to locate their mobile workers by simply asking Alexa where a person is by name – or a vehicle by its ID number. Alexa immediately responds giving the current vehicle location and where it is going, if traveling. Digital Twins – are they taking the technology world by storm? 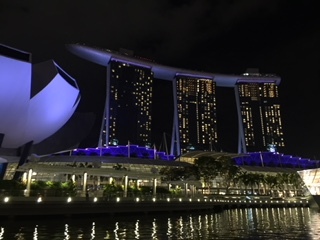 IDC recently noted that by 2020, 30% of global 2000 companies will be using data from Digital Twins to improve organizational productivity by as much as 25%. 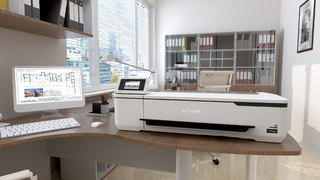 While it is not quite there, Gartner predicts the Digital Twin will reach the “Plateau of Productivity” within 5 to 10 years. 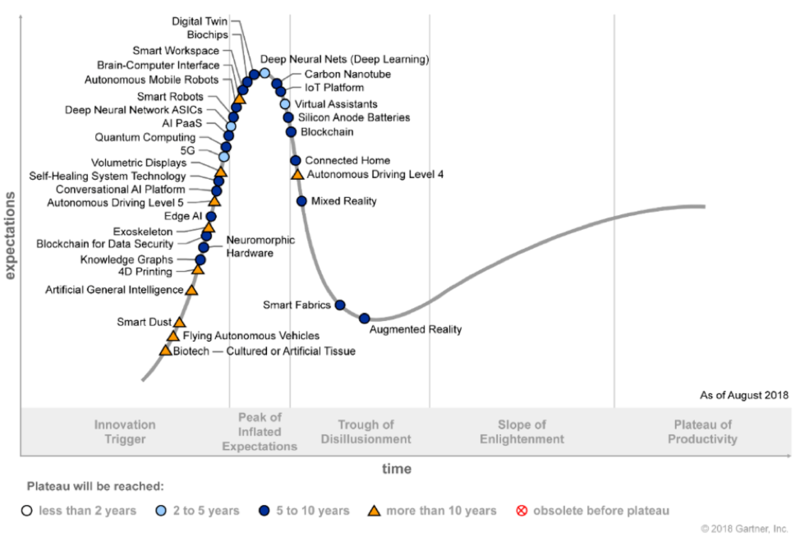 According to the 2018 Gartner Hype Cycle, Digital Twin is a trend that is now approaching the “Peak of Inflated Expectations” and is estimated to hit the “Plateau of Productivity” within 5 to 10 years. Image courtesy of Gartner, Inc.
Kevin Jones, Executive Director of Marketing for PCI Geomatics, spoke with GISCafe Voice about the release of new software for Geomatica and GXL, the company’s flagship software for complete and integrated desktop and enterprise geoimage processing. Geomatica features tools for remote sensing, digital photogrammetry, geospatial analysis, mosaicking, and more that can be deployed through the Geomatica desktop, Python workflows, or through large-volume-production systems. 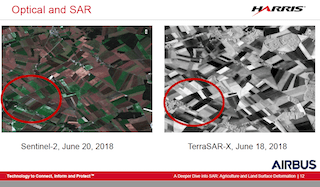 The focus of the new release is enabling big data processing for large archives of satellite data, which need to be processed to a scientifically rigorous level known as Analysis Ready Data (ARD). The new ARD tools provide methods to create datasets that can then be used for Multi-Temporal Analytics (MTA) leveraging the Open Data Cube infrastructure. Aerial mapping company Bluesky, working in concert with the company Ambiental Risk Analytics (ARA), has supplied photogrammetrically derived Digital Terrain Models (DTM) for the whole of England, Scotland and Wales. 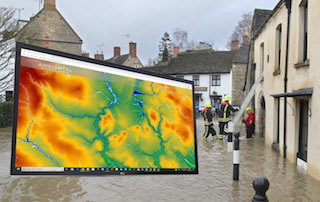 These 3D models include river flow and rainfall data and allow ARA to deliver a range of flood risk information for any property in the UK primarily to insurance companies, government agencies, emergency response and property developers. Mapillary, the street-level imagery platform that uses computer vision to work with and manage the world’s maps, this week announced a new tool that allows cities and mapmakers to take control over their map data collection in order to build better maps at scale. 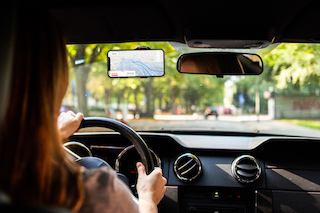 Capture Projects consists of a combination of a web and a mobile app, named Mapillary for Drivers, that gives cities and mapmakers the ability to task and manage an unlimited number of drivers to capture street-level imagery at any given point, increasing how quickly map data can be generated just using cameras.